On Tuesday the 4th of October Ruby interviewed Casey and Jeni from the Torry Back Court Regeneration Project. Casey and Jeni spoke about the scheme which will involve removing the wash houses at the back of Tullos Place to create a bigger, brighter and friendlier space within these courts for residents. The removal of the wash houses from 6- 18 Tullos place and 10 Tullos Circle will take place this month. · The existing paving, rear steps and handrails to be made good. Planting is to be provided at the end of the works to enhance the amenity of the neighbourhood for residents and wildlife. 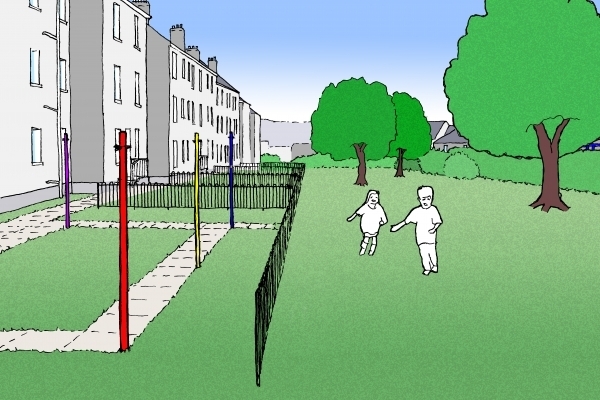 There is also funding available to improve unused green space behind Tullos Place, Crescent and Mansefield Place. A small steering group of local tenants has been formed to take the project forward in conjunction with city council staff and support from others. Local tenants and residents will be involved in the process of gathering ideas on ways the money can be spent to improve the green space and develop it for community use. There will be a voting exercise this month where local residents will be ask for their preferred idea and the most popular one will be taken forward. If you would like to get in touch with Jeni you can contact her on jenwright@aberdeencity.gov.uk or 07557014146. To listen to the show again click here.